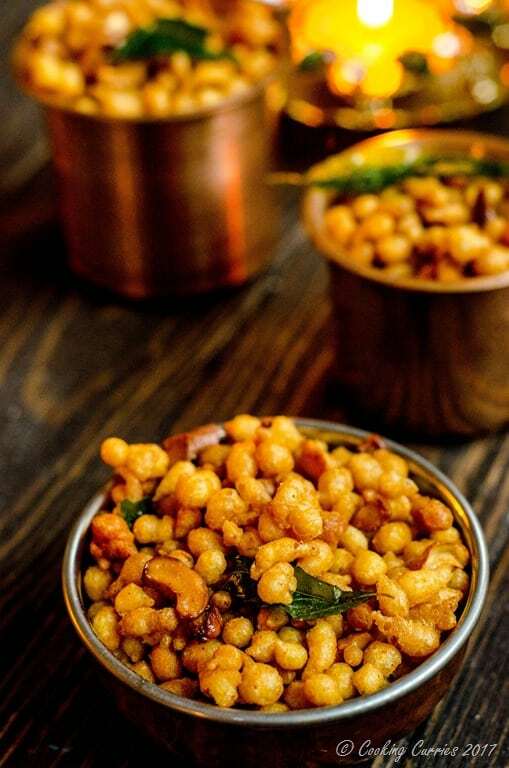 Spicy and crunchy little nuggets of chickpea flour that is just so perfect to keep munching along with a hot cup of chai, this Kara Boondi is a perfect tea time snack as well as a well deserved savory break from all the sweet bites during the festive season! 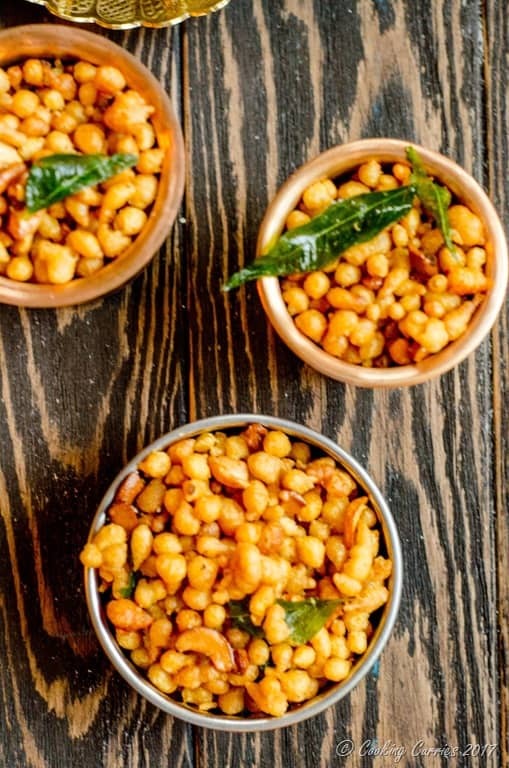 Kara boondi is a simple and easy to make savory snack, though it looks a little complicated to get those little crispy dumplings. Even though I always knew that a slotted ladle was used to pour the batter into hot oil, I somehow could not picture it and certainly could not picture it working out when I tried to make it. But I did take the plunge one day and tried it and you wont believe it, it was so simple and the whole slotted ladle thing worked like a charm. I didn’t have to do a trial run. I got it down the first time I tried. It is that easy, you guys. I have included step by step pictures below to show you guys just how easy it is to make and so you also get it just right the first time you try it. 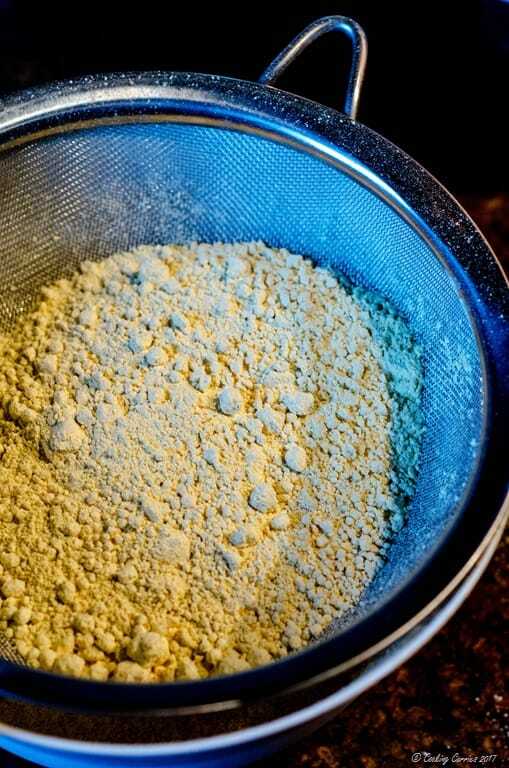 Sieve the besan, red chilli powder, asafetida, brown rice flour, spelt flour and salt together to a medium bowl. Add about a cup and half of water and whisk well without any lumps. The consistency should be that of a thin pancake batter or crepe batter. Heat the oil to deep fry. 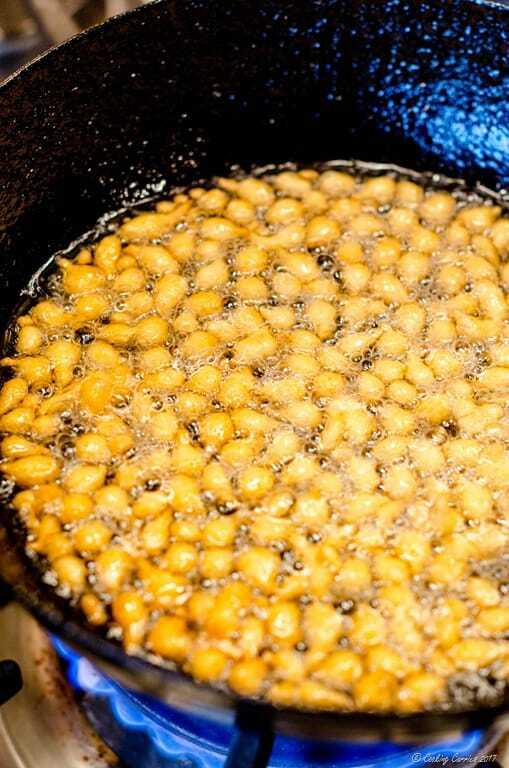 Add the cashew nuts and curry leaves to the oil, fry till curry leaves are crispy and cashews turn light golden brown. Drain on paper towels and keep aside. Hold a slotted spoon / ladle over the pan or oil and pour a small amount of batter on it. 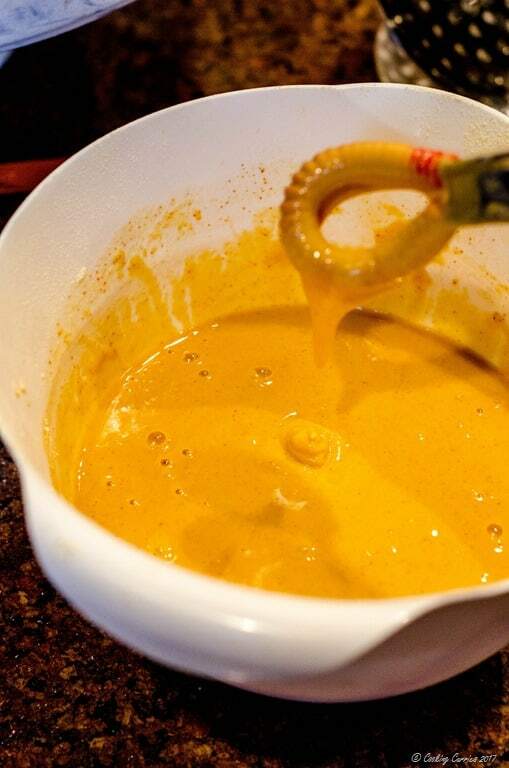 Push the batter down in a circular motion with the spoon that you pour the batter. The batter will fall through the holes into the oil and that is how you get that little dumpling shape. Fry till golden brown and drain onto paper towels. Repeat with the rest of the batter. 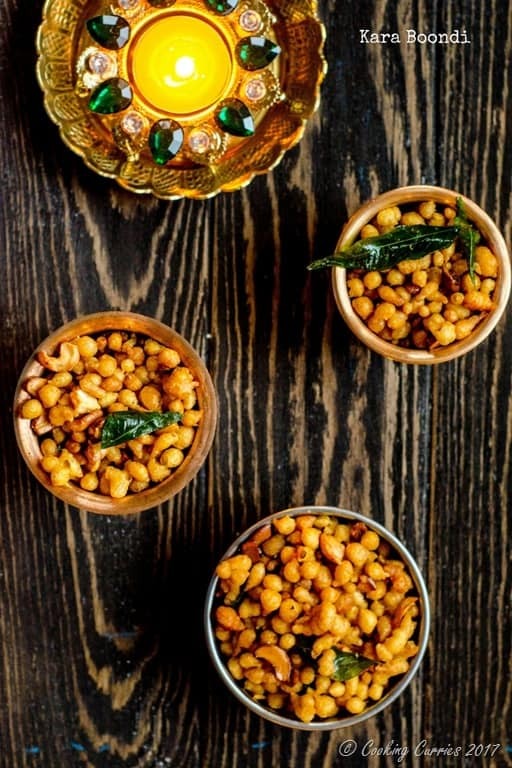 Mix together the fried boondi dumplings and the cashews and curry leaves. Add the 1 tsp red chilli powder to this and add more salt, if needed. Do this while the boondi is still hot. Toss well. Let it cool down to room temperature. Store in an airtight jar. 3. Heat oil for deep frying. 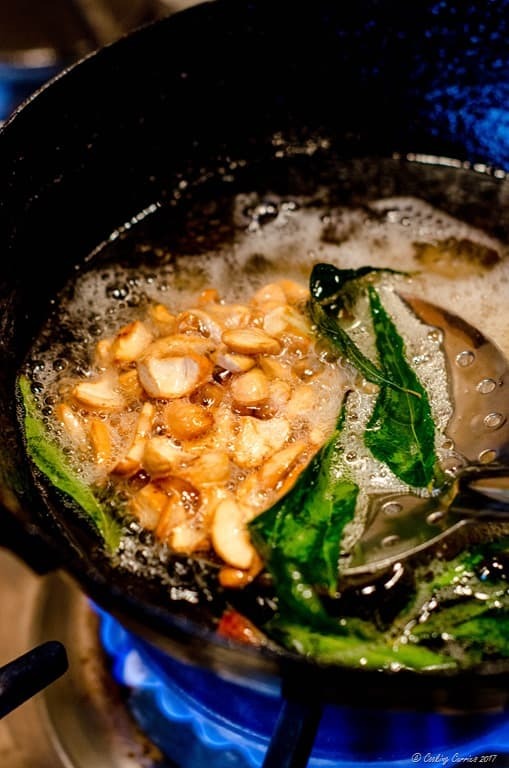 Add the cashew nuts and curry leaves to the oil, fry till curry leaves are crispy and cashews turn light golden brown. Drain on paper towels and keep aside. 4. 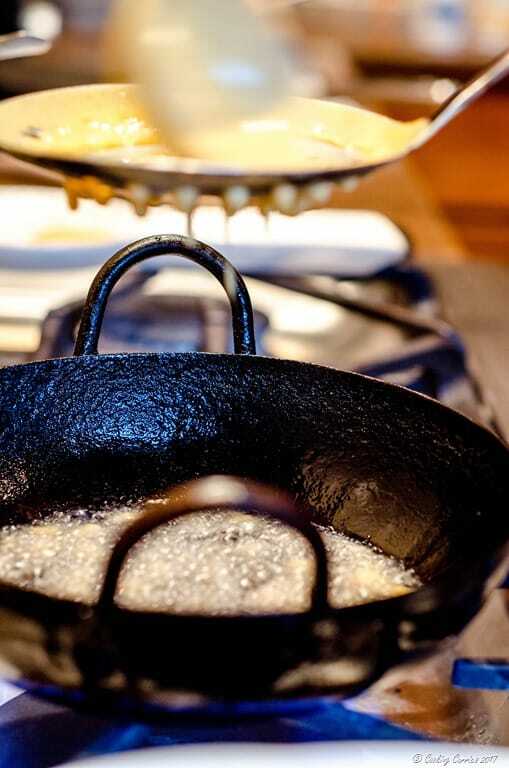 Hold a slotted spoon / ladle over the pan or oil and pour a small amount of batter on it. 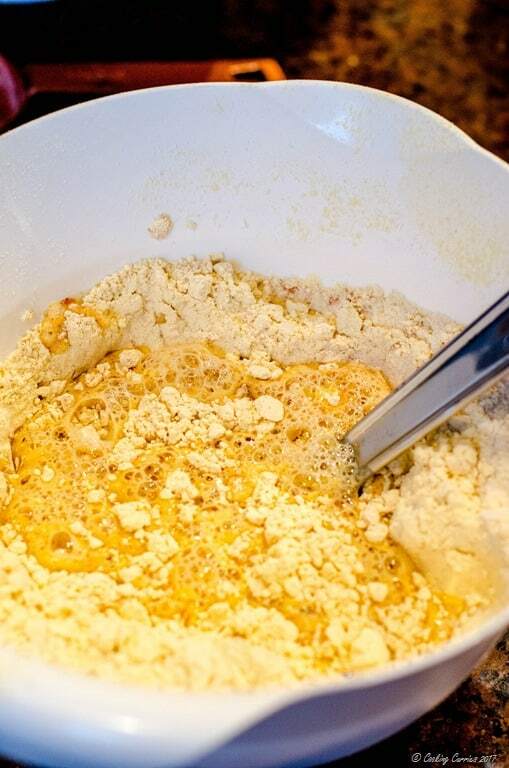 Push the batter down in a circular motion with the spoon that you pour the batter. The batter will fall through the holes into the oil and that is how you get that little dumpling shape. 5. Fry till golden brown and drain onto paper towels. Repeat with the rest of the batter.